Above: Kit Harington, Liv Tyler and Sian Webber in Gunpowder. ‘This was a century of fierce religious conflict which was defined by conflict wrought by the competing powers of state battling for supremacy.’ Photograph: Robert Viglaski/BBC / Kudos. The following article appeared in The Guardian last week, and it not only got me thinking about my favourite period in British and European history, one which had me dressing up as a Roundhead army chaplain in the Sealed Knot, but also researching into both my own ancestors from that period and those of ‘Kit Harington’. Just as it’s quite likely that my own ancestors were on both sides of the Gunpowder Rebellion, as it should more properly be called, it is certain that this was the case with those of the now famous actor. As a historical event, it is not unsurprising that the ‘Plot’ should be seen as a precursor to the full-scale civil wars which were to dominate the middle years of the century both in Britain and on the continent, but the nature of the actual and potential violence involved was more reminiscent of the previous century than it was of the battles, sieges and skirmishes which provided the context for the fratricide of the new one. Life in the 1600s remained as ‘nasty, brutal and short’ as it had done in the 1500s, but for most of the population this was due to the virulence of pestilences in Britain, whereas in Tudor times many had lived in terror of the violence of the state towards the adherents of the Catholic cause on the one hand, or Protestantism on the other. The Peace of Augsburg of 1555 had given both sides the right to impose their faith on the other through the rulers of the cities and states in which they lived. Civilian Catholics were massacred in the North of England, the Huguenots were massacred on St Bartholemew’s Day 1572 in France and thereafter ‘harried out of the land’ by Louis XIV, and the Dutch fought a guerilla war against the Spanish Empire’s Counter-Reforming zeal. In all of this, torture and the torch were the main weapons of oppression of both individuals and whole communities. Against this backcloth, plots and counter-plots became the order of the day in Elizabeth’s reign. Admittedly, had the 1605 Plot succeeded in blowing up the entire Establishment at Westminster, it would have dwarfed even the Spanish Armada in the scale of its attempt to restore Britain to Catholic Christendom, but in its abject failure it mirrored the Earl of Essex’s ‘Rebellion’ against Queen Elizabeth of four years earlier. When battles and skirmishes are re-enacted, the attempt to portray the nature and extent of the violence on TV is often shielded from the viewer by the rapid repetition with which it occurs, together with the sheer scale of the events depicted. Massacres of baggage trains are beginning to be shown, but generally the violence is seen as occurring between armed forces roughly equal in their power of arms. Despite this, I was recently reminded of the importance of the unsentimental portrayal of violence in children’s literature from this period, in reading Captain Maryat’s Children of the New Forest to my eleven-year-old son. Maryat made no attempt to shield his young readers from the results of violent acts on the individual. To depict the more personal and individual violence inflicted by powerful states in the sixteenth and early seventeenth centuries in massacres and executions, it is the inequality of power which needs to be depicted. That is one reason why I find the reaction to violent ‘re-enactments’ and representations of historical realities so surprising, especially when they come from historians. Unnecessarily gruesome and brutal”, “sickening” and “gore-filled” are just some of the ways Kit Harington’s new BBC series, Gunpowder, has been described by viewers and critics. The series follows the events of the plot to blow up the House of Lords in 1605 and, during the first episode, we saw a Catholic woman crushed to death as punishment for her faith, and a Jesuit priest hanged, drawn and quartered. We saw the blood. We saw the guts. We saw the pain. Unsurprisingly, some viewers were shocked, and have argued that the explicit violence was gratuitous and too much for a Saturday night TV show. But when it comes to history on television, too often the brutal reality of everyday life is brushed under the sumptuous carpets of romantic period dramas… Dramas such as Gunpowder (and, indeed, ‘Peaky Blinders’ and ‘Harlots’) provide a crucial insight into a violent past that modern Brits need to confront. What’s more, it is only by understanding this past that we can begin to fully understand the religious persecutions of our history and the country we live in today. That Gunpowder is shockingly violent is undeniable, but what is also undeniable is that it provides an authentic glimpse into the real, raw world that 17th-century people had to endure. Actually, another reason for my surprise at the way some critics have reacted, is that ‘it’s all been done before’. There was an excellent historical drama on the Plot in 2005 (with Robert Carlyle as James I) which also contained graphic violence, including the gruesome execution of Jesuit priests. What was most interesting, however, was the way in which James I’s change of policy in reviving the more barbaric forms of execution was justified with reference to the Jesuit belief that martyrdom would result in them going straight to heaven, without passing through purgatory. In the film, both James and his wife, Anne of Denmark, agree that only a slow and agonising death would act as a deterrence. Although the violent solution may be very much of the late sixteenth and early seventeenth century, there is little doubt that the failure of deterrence used by powerful but democratic states today leaves them vulnerable to terrorism on a small-scale, as well as on a larger one. Yet we are critical when counter-terrorist forces use even discriminatory violence to ‘take out’ suspect terrorists ‘in theatre’ in order to prevent them from mounting further attacks and to deter others from joining the ‘jihadis’. Arguably, the gruesome death of my own ancestors, the Wintour brothers, made them more central to the Plot as it occurred than even Catesby, whom they recruited as a ‘celebrity’ leader, though he himself was a recent convert to Catholicism. In the end, it was the brothers, from a long line of noble and gentlemen recusants, degraded through persecution, who paid for their choice and his mistakes by facing the Scaffold, since both ‘financiers’, Catesby and Percy, were killed (allegedly by the same musket-ball) at the siege at Holbeach. It was the gruesome death of two brothers with the right to wear Plantagenet coats of arms, which finally terrorised the Catholic gentry of the Midlands into submission and put an end to the Plantaganet plotting which had continued since their defeat at Stoke Field in 1487. Elizabeth’s policy of fines and imprisonment had failed, hence the reintroduction of more barbaric methods of torture and execution. I shall be interested to see how well this dilemma is portrayed in this series, or whether it simply succeeds in substituting one ‘celebrity’, Guy Fawkes, for another, Robert Catesby. Perhaps Kit Harington might have made his drama less violent, and at the same time more interesting, by paying homage to the other side of his family, who were just as involved in the events of 1603-5 as the Catesbys and the Wintours. In addition to being a direct descendant of Robert Catesby through his mother, from whose maiden name he acquired his middle name, Catesby, Christopher (or ‘Kit’ from Shakespeare’s contemporary playwright, Christopher Marlowe) Harington is directly descended through his paternal grandfather, Sir Richard Harington, 14th baronet, to the sixteenth century Haringtons, to Sir James Harington of Exton, Rutland and his sons. Sir John Harington, created 1st baronet Exton at the coronation of James I, was a close member of the courts of both Elizabeth I and Mary Queen of Scots. Sir James Harington, the third son, became 1st baronet of Ridlington, from whom Kit Harington’s father is directly descended. Sir John Harington became guardian and tutor to the King’s daughter, Elizabeth, on whom the Midland Rebellion centred, and who was spirited away to the walled city of Coventry from Harington’s home at nearby Coombe Abbey on the night the plot in London was ‘discovered’ by the King and Cecil. This followed their receipt of the anonymous warning letter, which both Catesby and Percy claimed to have been written to Lord Monteagle by Francis Tresham, the thirteenth plotter. But Tresham pleaded his innocence, and recent evidence suggests that the letter have been written by Henry Percy, Duke of Northumberland, Thomas Percy’s own cousin and patron. He was also the man most likely to become Elizabeth’s Protector, had the Plot succeeded. Both Thomas and Henry had been frequent guests at Coombe Abbey, so both would have known the young princess well. In an extraordinary act of bravado Catesby had planned to go hunting with James just before the opening of Parliament, but was warned of the ‘betrayal’ by Monteagle’s servant. Harington accompanied the Earl of Warwick, Fulke Greville, in his pursuit and besieging of the rebels at Holbeach House. He had himself been made High Sheriff of Rutland under Elizabeth and was Greville’s Deputy Lieutenant in Warwickshire. Sir John had acquired Coombe Abbey on his marriage to Anne Kelway. Though the Haringtons were a Rutland family, they claimed descent from the Scottish Bruces, hence their closeness to the royal family. Harington had accompanied Mary Queen of Scots on her progress from Staffordshire to Fotheringay in Northamptonshire, and his wife attended on Anne of Denmark, James’ Queen consort, during her stay in Edinburgh, as well as on the couple’s progress to London in the spring of 1603. The Princess Elizabeth broke her journey to attend the coronation two months later, and had been just seven years of age when her new governor brought her to live at Coombe Abbey in October. It remained her chief place of residence between 1603 and 1608. There she formed a close friendship with Harington’s niece, Ann Dudley. It is said that they could often be seen going off for walks in the nearby woods, or sitting together in the beautiful formal gardens that immediately surrounded the house. The second baronet Exton, John Harington, born at Coombe in 1592, was a close friend and companion of Henry Frederick, Prince of Wales, on 5 January 1604 he was created, along with The Duke of York and others, a Knight of the Bath. In September he went a foreign tour with John Tovey, a master of the free school at Guildford, who later became Elizabeth’s Tutor and Chaplain during her time at Coombe, when he was master of the Free School in Coventry. While abroad, young John corresponded in French and Latin with Prince Henry. After seven weeks in the Low Countries, where he visited the universities, courts of three princes, and military fortifications, he went to Italy in 1608. He wrote from Venice (28 May 1609) announcing his intention of returning through France to spend the rest of his life with his royal friend. Henry’s death (6 November 1612) greatly grieved him, as it did his sister (I have written about their sibling relationship elsewhere on this site). The following year, Elizabeth married Frederick V, Elector Palatine and Lord Harington accompanied her to the Electoral Palatinate, but died at Worms, Germany on his way home in 1613. After his death his estate at Exton was sold to pay his creditors, so the young Lord Harington had only the Coombe estate to fall back on. Aged 21, he never recovered from the debts his father had incurred in providing royal hospitality, and continued to grieve deeply for Prince Henry. He died in 1614 and was buried at Exton with an eulogy from John Donne. Not only did Coombe host Prince Henry on an occasional basis, in addition to the Princess, but the Harington’s second home also provided lodging to several Scottish and English noblemen, including two Percies, a Devereux, a Hume and a Bruce. The combined households of the Prince and Princess numbered 141 above and 85 below stairs. At one point, Lord Harington was entertaining no fewer than 426 guests at the Abbey, of whom 207 were in receipt of salaries and a further 97 were employed by the architect Inigo Jones, who had been hired to carry out renovations at this time. It may have been Thomas Percy’s frequent visits to Coombe which led to the plot to capture the royal princess. The rebels may have hoped that Prince Henry would have been there too. He was only two years older than Elizabeth in 1605, aged 11. If he was in the House of Lords with his father, as Prince of Wales, he would lose his life. Thomas Percy, as a member of the royal household, was trying to find out what the plans were, but seems not to have succeeded in doing so before the fuse was about be lit. He visited his cousin on 4th November, to find out how much Northumberland, and perhaps others, knew about the plot. The younger of James’ sons, Prince Charles, was quite a sickly child, and was not expected to long outlive his brother, although he was second in line before Elizabeth. Percy had visited him on 1 November to try to ascertain his whereabouts on 5th. It therefore seemed to be a lower-risk strategy to kidnap Elizabeth from her country residence than to attempt to smuggle Charles out of his rooms in Whitehall, where he would have been surrounded by guards. In any case, the people would surely warm to a talented young woman as Queen who, even at the age of seven, was displaying all the skills of her illustrious aunt and namesake, and James had probably not yet fixed the succession in any case. At Allhallowtide on 31 October, 1603, Catesby had sent for his cousin Thomas Wintour, who was at Huddington Court in Worcestershire with his brother Robert. As descendents of both the Golafre and Huddington families, they were entitled to wear the baronial coats of arms of both families. Thomas was educated as a lawyer and had fought for England in the Low Countries, but in 1600 had converted to Catholicism. Following the Earl of Essex’s failed rebellion, he had travelled to Spain to raise support for English Catholics, a mission which the authorities would later describe as comprising part of a ‘Spanish Treason’. Although Thomas declined his invitation, Catesby again invited him in February the next year. They were related through the wealthy recusant Throckmorton family of Coughton Court in Warwickshire, which was to feature in the plot. When Wintour responded to the summons he found his cousin with the swordsman John Wright. Catesby told him of his plan to kill the king and his government by blowing up “the Parliament howse with Gunpowder … in that place have they done us all the mischiefe, and perchance God hath designed that place for their punishment.” Wintour at first objected to his cousin’s scheme, but Catesby, who said that “the nature of the disease required so sharp a remedy”, won him over. Despite Catholic Spain’s moves toward diplomacy with England, Catesby still harboured hopes of foreign support and a peaceful solution. Wintour therefore returned to the continent, where he tried unsuccessfully to persuade the affable Constable of Castille to press for good terms for English Catholics in forthcoming peace negotiations. He then turned to Sir William Stanley, an English Catholic and veteran commander who had switched sides from England to Spain, and the exiled Welsh spy Hugh Owen; both cast doubt on the plotters’ chances of receiving Spanish support. 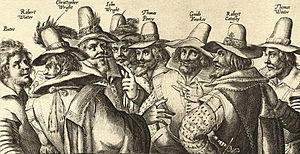 Owen did, however, introduce Wintour to Guy Fawkes, whose name Catesby had already supplied as “a confidant gentleman” who might enter their ranks. Fawkes was a devout English Catholic who had travelled to the continent to fight for Spain in the Dutch War of Independence. Wintour told him of their plan to “doe some whatt in Ingland if the pece with Spaine healped us nott”, and thus in April 1604 the two men returned home. Wintour told Catesby that despite positive noises from the Spanish, he feared that they “the deeds would nott answere”. This was a response that in Nicholls’s opinion came as no surprise to Catesby, who wanted and expected nothing less. A contemporary engraving of eight of the thirteen conspirators, by Crispijn van de Passe; Catesby is second from the right. Early in June 1605, Catesby met the principal Jesuit in England, Father Henry Garnet, on Thames Street in London. While discussing the war in Flanders, Catesby asked about the morality of “killing innocents”, in other words, the royal children who would be at the state opening of Parliament. This continued to prick the consciences of the plotters right up until 4th November, which is why they sought opportunities to kidnap all three of the children. It is also notable that this is what sets them apart from more recent terrorists, who have no such moral qualms in sacrificing children to their cause. Garnet said that such actions could often be excused, but according to his own account during a second meeting in July he showed Catesby a letter from the pope which forbade rebellion anyway. Catesby replied, “Whatever I mean to do, if the Pope knew, he would not hinder for the general good of our country.” Father Garnet’s protestations prompted Catesby’s next reply, “I am not bound to take knowledge by you of the Pope’s will.”Soon after, Father Tesimond told Father Garnet that, while taking Catesby’s confession, he had learned of the plot. Father Garnet met with Catesby a third time on 24 July at White Webbs in Enfield Chase, the home of Catesby’s wealthy relative Anne Vaux, and a house long suspected by the government of harbouring Jesuit priests. Without acknowledging that he was aware of the precise nature of the plot, the priest tried in vain to dissuade Catesby from his course. At the beginning of November, as Fawkes made a final check on the gunpowder, other conspirators took up their positions in the Midlands. Robert Cecil, Lord Salisbury, already aware of certain stirrings before he received the letter, did not yet know the exact nature of the plot or who exactly was involved. He elected to wait, to see how events unfolded. On 3 November, Catesby met with Wintour and Percy in London. Although the nature of their discussion is unknown, Antonia Fraser theorises that some adjustment of their plan to abduct Princess Elizabeth may have occurred, as later accounts told how Percy had been seen at Charles, Duke of York’s lodgings, also enquiring as to the movements of the king’s daughter. A week earlier—on the same day that Monteagle received his letter—Catesby had been at White Webbs with Fawkes, to discuss kidnapping Prince Henry rather than Princess Elizabeth. As already conjectured, he may have received information from Percy that both the Prince and Princess would be at Coombe during the state opening, though Fawkes’ possible involvement may also suggest that he would kidnap the Prince from Whitehall, perhaps with the help of Percy. Certainly, it seems to have been part of the plan for Henry Percy to become Elizabeth’s Protector had the Plot in London succeeded. Both Thomas and Henry were probably well-known to both Prince Henry and Princess Elizabeth, from the time they spent together at Coombe Abbey. The events of the night of 4th-5th November are well-known. Catesby and Percy met up with other gentry under the guise of a hunting match on Dunsmore near Coombe Abbey. When the news from London reached the ears of those assembled at Dunchurch, most refused to join Catesby’s rebellion. Those who did rode off in the direction of Warwick, seemingly abandoning their plan to kidnap the Princess Elizabeth. On 6 November the rebels raided Warwick Castle for supplies, before continuing to Norbrook to collect stored weapons. From there they continued their journey to Huddington in Worcestershire. Catesby gave his servant Bates a letter to deliver to Father Garnet and the other priests gathered at Coughton Court, informing them of what had transpired, and asking for their help in raising an army in Wales, where Catholic support was believed to be strong. The priest begged Catesby and his followers to stop their “wicked actions”, and to listen to the Pope’s preachings. Father Garnet fled, and managed to evade capture for several weeks. Catesby and the others arrived at Huddington at about 2:00 pm, and were met by Thomas Wintour. Terrified of being associated with the fugitives, family members and former friends showed them no sympathy. Meanwhile, it was also on the morning of 6th November that Lord Harington received a letter from Mr Benock, the Horse Trainer at Warwick Castle, informing him that John Grant of Norbrook had stolen some of the war horses and, judging from the manner in which these circumstances occurred, he feared that insurrection was at hand in the country. Harington wrote immediately to Salisbury, enclosing Benock’s letter and asking for an immediate reply as to what was to be done if there was indeed a rebellion taking place. He then arranged for the Princess Elizabeth to be taken into the walled City of Coventry, where she was lodged in the Palace Yard, remaining there until the apparent danger had passed. The citizens of Coventry, loyal protestants all, rallied to her defence and armed themselves in readiness. Harington himself rode to Warwick Castle to lend Sir Fulke Greville, as County Sheriff, his assistance in the pursuit of the rebels, who by this time were already at Huddington. Back in London, under pain of torture, Fawkes had started to reveal what he knew, and on 7 November the government named Catesby as a wanted man. Early that morning at Huddington, the remaining outlaws went to confession, before taking the sacrament — in Fraser’s opinion, a sign that none of them thought they had long to live. The party of fugitives, which included those at the centre of the plot, their supporters and Digby’s hunting party, by now had dwindled to only thirty-six in number. From there, they struck out for Staffordshire and Holbeche House, perhaps still with the intention of trying to raise a Welsh army. The House was home to Stephen Lyttleton, one of their party. The following day, 8th November, while the fugitives were recovering from injuries sustained in an accident while trying to dry the gunpowder, the sheriffs of Staffordshire and Worcestershire had joined Fulke Greville’s posse from Warwickshire. Percy and Catesby slain in attempting their escape from Holbeach, unknown artist. Again, the main events are relatively well-known. Richard Walsh, Sheriff of Worcester, and his company of 200 men besieged Holbeche House at about 11:00 a.m. While crossing the courtyard Thomas Wintour was hit in the shoulder. John Wright was shot, followed by his brother, and then Rookwood. Catesby and Percy were reportedly both dropped by a single lucky shot, while standing near the door, and not, as depicted above, in the sword-fight in which Catesby had vowed to die defending his faith. He managed to crawl inside the house, where his body was later found, clutching a picture of the Virgin Mary. The survivors were taken into custody and the dead buried near Holbeche. On the orders of the Earl of Northampton however, the bodies of Catesby and Percy were later exhumed and decapitated, their heads taken to London to be placed on spikes to look upon the parliament buildings they had failed to destroy. With Thomas Percy dead, there was nobody who could either implicate or clear his cousin, Henry Percy of any involvement in the plot. Some have speculated that this was why Catesby and Thomas Percy were not captured alive at Holbeach, along with most of the other conspirators, and why they were mysteriously killed by the same musket ball. Was someone under orders to make sure they did not survive to tell the tale, or, as seems more likely, were they determined to die then and there rather than implicating others under torture? Certainly, it seems strange that they were the only principle plotters to meet their end under musket fire, when the group as a whole, about thirty in number at most, could easily have been wiped out by a force of two hundred trained musketeers. As it was, Henry’s failure to ensure that Thomas took the Oath of Supremacy upon his appointment as a Gentleman Pensioner, and their meeting on 4 November, constituted damning evidence. The Privy Council also suspected that had the plot succeeded, he would have been Princess Elizabeth’s Lord Protector. With insufficient evidence to convict him, however, he was charged with contempt, fined £30,000 and stripped of all public offices. He remained in the Tower until 1621. Our great care and honourable charge entrusted to us by the King’s majesty hath been a matter of so much concern that it almost effaced the attentions of kin or friend. With God’s assistance we hope to do our lady Elizabeth such service as is due to her princely endowments and natural abilities, both which appear the sweet dawning of future comfort to her Royal Father. The late devilish conspiracy did much to disturb this part. I went with Sir Fulke Greville to alarm the neighbourhood and surprise the villains who came to Holbeche and was out five days in peril of death, in fear for the great charge I had left at home. Her highness doth often say, “What a Queen I should have been by this means. I had rather have been with my Royal Father in the Parliament House, than wear his crown on such condition.” This poor Lady hath not yet recovered the surprise and is very ill and troubled. The princess remained at Coombe for another three years, until at Christmas 1608 she moved to her own establishment at Kew, though Lord Harington still controlled her movements and expenditure. This was the source of many of Harington’s troubles, since the two thousand pounds a year pension promised by the King was never paid, but, in any case, would have come nowhere near meeting the princess’ expenditure, which in 1612-13 alone was in the region of 3,500 pounds (she was unaware of these debts, unpaid by her father, until after her wedding). She was married to Frederick, Elector Palatine, on Valentine’s Day in 1613, despite her mother’s disapproval, and Lord Harington rode at the head of the wedding procession to Whitehall. He also bore the costs of the wedding, later disclosing that it had cost him in the region of thirty thousand pounds to take care of her. Lord and Lady Harington accompanied the Royal couple to Heidelberg after the wedding, as did Elizabeth’s friend, Ann Dudley. Frederick was so besotted by his new bride that he had a whole new wing of the castle built for her and her servants. Harington stayed at Heidelberg for a further four months, arbitrating in various disputes within her household in his role as Royal Ambassador. Worn out by these cares and concerns, he decided to return to England, but died of a fever at Worms, only fifty miles from the castle. His body was returned to Exton for burial, after which Lady Harington was invited to rejoin Elizabeth’s household. Finally, James granted her a stipend of five thousand pounds. Young John Harington, who became the 2nd baron of Exton, a teenager at the time of the plot, later remembered making an opportune study of the heads of Robert Catesby and Thomas Percy while en route to London, and later reflected: “more terrible countenances were never looked upon”. The second baronet, described by one of his companions as the most complete young gentleman of his age that this kingdom could afford for religion, learning and courteous behaviour, tragically died of smallpox in February 1614, aged just 22, having sold his family home at Exton just a week before. The Coombe estates passed to his sister Lucy, by then the Countess of Bedford, though she was forced to sell it to cover her gambling debts, to Elizabeth Craven, the widow of William Craven, in 1622. By a strange twist of fate, their eldest son, also William Craven, entered the service of Maurice, Prince of Orange, in the fight to restore the Bohemian Crown to Frederick and Elizabeth, the couple now known as ‘the winter King and Queen’ of Bohemia, having been deposed by the Hapsburgs after just one winter in Prague. These were the events which marked the beginning the Thirty Years’ War in 1618, which laid waste to much of Europe. In 1632, Frederick and Elizabeth were refugees at the court of the Prince of Orange in the Netherlands. Lord Craven was among the first to respond to the call to reinstate the exiles to the throne of Bohemia, and was appointed one of the commanders of the English army in Germany. He accompanied Frederick when he left the Hague to begin his campaign. He led his British volunteers on a seemingly hopeless attack on the Fortress at Creuznach, himself planting the Bohemian standard in victory on the Citadel walls. He was knighted by King Gustavus Adolphus of Sweden as he lay wounded among the ruins. King Gustavus was killed during the victorious Battle of Lutzen. This demoralised Frederick so much that he gave up the fight, falling into a fit of melancholy which, together with illness, brought about his death in November 1632. The following year, Craven returned to England, where he received a hero’s welcome and Charles I granted him permission to enclose six hundred acres around Coombe Abbey to form a park. He became the principal benefactor for the widowed Elizabeth and in 1637 was back on the continent fighting for Prince Rupert, her eldest son, in his attempt to regain his father’s throne. They were both captured at the Battle of Limgea but, having secured his own release on ransom of twenty thousand pounds, Craven remained in Germany to secure Prince Rupert’s release on the condition that he ceased hostilities against the Emperor. Shortly after Craven returned to England, but in 1640 he moved permanently to Elizabeth’s Court at the Hague. Although supporting Charles I on the outbreak of the Civil War in 1642, he remained abroad and aided the Royalist cause with financial contributions. When Parliament eventually won the war, the majority of his estates were confiscated. However, his prospective heir had married into the Fairfax family, leading Parliamentarians, so the Cravens were allowed to keep Coombe Abbey. When, following his restoration in 1660, King Charles II turned his back on his aunt, making no palace or house available to her, Craven, who had continued to support her in the Hague, offered her his own house in Drury Lane. She continued to live there until 1662, when she leased her own dwelling at Leicester House. There she died a fortnight after moving in, on 26 February, aged 66. There were rumours of a romantic relationship between Craven and Elizabeth, and some suggested that a private marriage existed between them. However, she was twelve years his senior, he having been born in 1608. Perhaps he was simply the perfect, gallant and chivalrous knight who had sworn to serve Elizabeth and considered it a great honour to do so. Certainly, he continued to spend vast amounts on her. When she died, he was having a country house built for her, Ashdown House, near his own house at Hamstead Marshall in Berkshire, which, along with Coombe Abbey, was also being rebuilt. The latter was leased to his godson, Isaac Gibson, and in 1667-1669 a new wing was added to the original Harington building. Lord Craven regained control of Coombe in the 1670s, putting his son and heir in charged of the planned alterations to the House. He had planned for some time to create an appropriate setting for collection of Stuart portraits left to him by the Queen of Bohemia. He may also have decided to house the few possessions she held at her death to a place where, as a child, she had spent her happiest hours. The idea to transform Hamstead Marshall into a “miniature Heidelberg” had never materialised and the sentimental links with Coombe Abbey may have persuaded Lord Craven to make Coombe Abbey their permanent home, as well as the principal family seat of the Cravens, following the death of the Earl himself. He eventually died on 9 April 1697 at Drury Lane, aged 89. We should not assume that people at that time were any more inured to the violence than we are to the use of torture and execution in the twentieth century (in recent memory). Neither was the state violence of the seventeenth century primarily anti-Catholic or religiously motivated. The executions, viewed in the context and the standards of the time, were punishments for treason, not heresy, as the Marian burnings had been. Nevertheless, the Jacobite policy was a radical return to methods not used since that time, an admission that Elizabeth I’s ‘via media’ had not worked in bringing about the Tudor dynasty’s hoped for security from foreign-sponsored plots and insurrections. This has also to be seen in the broader geographical context of a successful counter-reformation in Europe led, violently, by the Hapsburgs, as evident in the Spanish Inquisition. Anti-Catholic feeling in Britain was certainly at a high water mark in 1601-5, manipulated by a vulnerable establishment. In this context, the Jesuits were seen as the ‘Jihadi’ apologists of a terrorist network stretching through the Spanish Netherlands to Wales and Ireland. In fact, their role in the Gunpowder Plot indicates that they were extremely reluctant to justify acts of violence by lay Catholics. As for the rest of the century, although it was one of continual conflict throughout Europe, it was not one of continuous violence in Britain and Ireland. Even the attack on Drogheda of 1649, although often described as a ‘massacre’ by Cromwell’s troops was, at the time, viewed as an act of war. Although an atrocity worthy of the title ‘war crime’, it should not be compared with the massacre of Protestant settlers which took place decades earlier. Again, the intention of the war in Ireland was to provide security for the newly established British Republic, not to terrorise the native population. Besides this, a fuller exploration of the lives of those associated with the events of 1605 would also suggest that, in British terms, that we need also to consider their constructive contribution in art, architecture and chivalry, not to mention their advocacy and practice of religious toleration and the refusal of many to take up arms in any cause. Life for many may have continued nasty, brutish and short in Burke’s well-known phrase, but it was not just about the enactment of sickening violence. Neither should it be re-enacted as such from an unearned sense of post-millenial, secular superiority.